Are the Knicks advertising a superstar free agent to get season ticket holders to renew? With the NBA’s All-Star Weekend just another week away, we’re well into the year of basketball, and it’s about that time that teams begin to notify season ticket holders of renewal options. Some teams have a treasure trove of carryover talent that they can use to sell ticket holders on reupping. Others... don’t. After sending Kristaps Porzingis to the Dallas Mavericks in a trade that cleared significant cap space, the New York Knicks seem to be advertising their max salary slots as much as any incumbents on their roster. As one current season ticket holder points out, there was an especially interesting image choice on their member page. 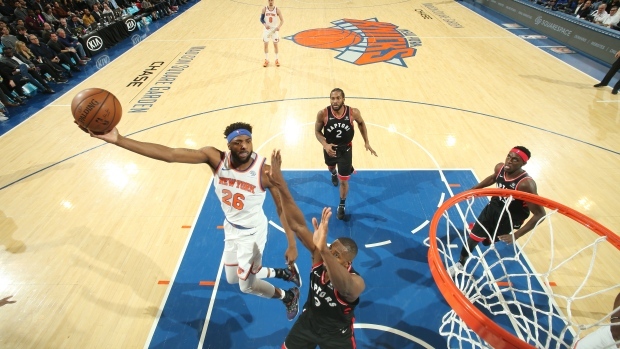 Rookie center Mitchell Robinson is the primary Knick being featured in the image, and sure, Robinson has been an exciting, springy 7-footer, but if you’re going to showcase a rookie for the future, why not Kevin Knox, the 9th overall pick who has had an even better rookie season than Robinson? Ah, right. That’s Future Knick Kevin Durant right there. they couldn’t work @KyrieIrving in there? Amid reports that Durant will consider the Knicks among his options as a free agent this summer, this is *probably* just a little nod in jest to the rumor, since it made some recent headlines after it led to a public confrontation between Durant and reporters. With that said, all signs point to a Knicks-Durant marriage being at least a very real possibility. Durant is just one of a loaded superstar class to hit free agency, one that also boasts Kawhi Leonard, Jimmy Butler, Kyrie Irving, Kemba Walker, Klay Thompson, DeMarcus Cousins and Tobias Harris. With so many high-level players on the market, you can bet that teams are already making their plans to woo them. For some players, such as Durant, it has been a stressor. For others? Well, it's a handy punchline.